Theo Mason/Pipe Dream Photographer Jonathan Austin, lead researcher and designer for the Violence Prevention Initiative at the Graduate Institute Geneva; Rachel Hatcher, a postdoctoral fellow at Concordia University in Canada; and Mike Brand of the African Peace Network speak on emerging mechanisms for preventing genocide at an inaugural conference hosted by BU’s Institute for Genocide and Mass Atrocity Prevention on Friday. 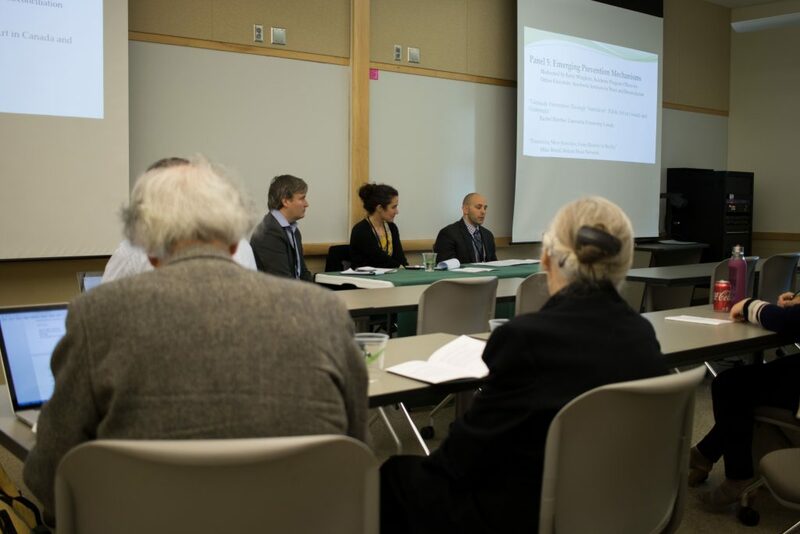 In an effort to increase the dialogue around ending genocide, the Institute for Genocide and Mass Atrocity Prevention (I-GMAP) at Binghamton University held its inaugural Frontiers of Prevention conference on Friday and Saturday. The two-day conference, held at the University Downtown Center, aimed to create a dialogue between distinguished scholars and practitioners to try to increase collaboration to end mass atrocities. Hosted by I-GMAP, an interdisciplinary institute formed by BU in 2017 to help bridge the gap between scholarship and practice in genocide and mass atrocity prevention, the conference was one of several events held throughout the year to shed light on the situation of mass atrocities around the world. One of the conference’s main objectives was to organize an open forum where leading academic researchers with programs dedicated to prevention can meet with practitioners, both in government and nongovernmental service. Provost Donald Nieman spoke about this goal in his introductory speech. The conference also aimed to form a critical evaluation of the current state of genocide and atrocity prevention mechanisms and an exploration of developing mechanisms and actors in the global effort to prevent atrocities. The event consisted of 11 panels that included themes such as assessing colonialism, new developments in data analysis and risk assessment and the future of prevention. Approximately 30 panelists and 30 attendees exchanged ideas on how to decrease the divide between scholars and practitioners, with suggestions ranging from scholars creating digests, which will transfer quantitative data into an easily interpretive work, and creating research guidelines for scholars. There was also discussion regarding global moves to counteract terrorism, and the possibilities of these actions exacerbating or mitigating attacks on civilian populations, something that is still being researched. Complex emergencies, major humanitarian dilemmas that are often the result of a combination of political instability, conflict and violence, social inequities and underlying poverty, were another hot topic of debate. The conference was created and moderated by co-directors of I-GMAP, Max Pensky, a professor of philosophy, and Nadia Rubaii, an associate professor of public administration. Pensky said he hopes the conference will continue on and facilitate a dialogue in the future. “This frontier of prevention is overidentified, yet underexplored,” Pensky said. Besides the invited guests and speakers, attendees included BU students. Jonathan Wu, an undeclared freshman, said he was surprised to hear BU had an entire institute dedicated to mass atrocity prevention.